Adhere J-trims using double-sided tape or tube adhesive. Inside corners don’t require any adhesive. They stay secure as two backsplash panels connect to them. 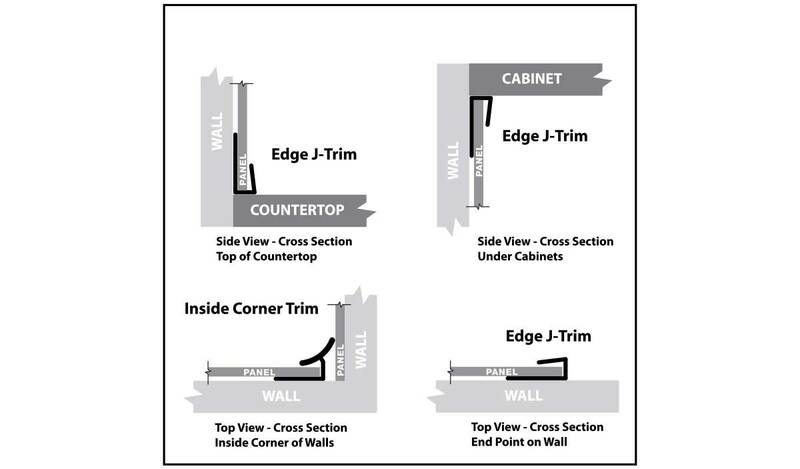 If the area to be covered ends on a flat wall, and you desire to finish the cut edge of the last panel, it can be done by using a piece of matching Edge J-Trim. This trim piece slides onto the cut edge of the panel. If you have an inside corner, we recommend using a piece of matching Inside Corner Trim. See drawing below.